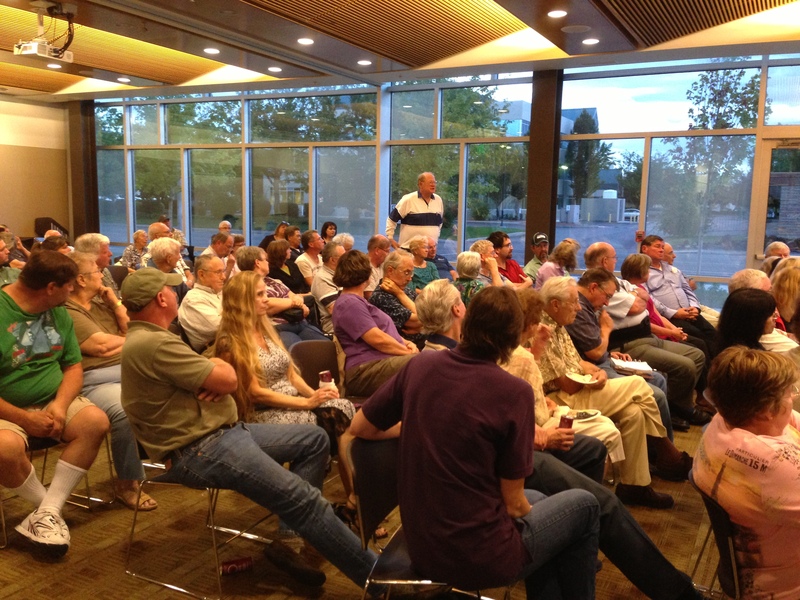 On September 17th, I joined an audience of folks at the Richland Public Library who gathered to hear historian Michelle Gerber’s talk on Hanford in the 1940s and to share stories of their own. As I learn more about Hanford, it becomes increasingly apparent that there are not one but many histories of the site. Listening to personal narratives allows me to approach the site’s history and its cleanup with a more nuanced and compassionate understanding of the people involved and affected by Hanford. Gerber described the context of the 1940s, which marked both the end of the great depression and the beginning of World War II. The war fervor swept the country, and millions of men were drafted. Tax rates and government debt soared as the war effort took off. A spirit of unity among those Americans supporting the war effort was juxtaposed with intensifying racism and the creation of internment camps. 100,000 people came to Hanford engineer works, recruited from all over the country. Women played a significant role in labor. Segregation and racism permeated the Hanford environment, with black workers assigned primarily to service positions. The Hanford effort was astounding in its size and scope. In one day, Hanford workers regularly consumed 5,000 pounds of sausage, 18,000 pork chops, and 12,000 gallons of beer. What exactly was being done at Hanford was unknown to almost all workers, and key words that would expose the truth were replaced with euphemisms. Plutonium was known only as “product,” and radiation as “danger.” The residents of Richland did eventually become aware of their role in the production of the atomic bomb, which provoked in many a sense of great pride that was at times tempered by a fervent desire for peace and somber contemplation of the role of weapons technology in the future of humankind. I am a newcomer to Hanford issues and history, and listening to Michelle Gerber and the other folks in the room who contributed their stories and memories was an important and thought-provoking experience. There are so many stakeholders that feel so strongly the repercussions of the Hanford site – those who have been displaced by the project, those who have gained employment, farmers, those who eat fish out of the river, and others who feel the lasting environmental impact of the site. I am grateful for spaces like the storytelling night in which dialogue and oral histories can be shared and preserved. I hope to seek out similar spaces in the future, and especially to hear more about the history and perspectives of tribes in the area. The level of complexity of the Hanford site’s history and cleanup means that I will never be done learning, but gradually I am increasing my capacity to help advocate for a just and thorough process that will protect the health of the environment and communities and respect the cultural significance of the Hanford Reach.